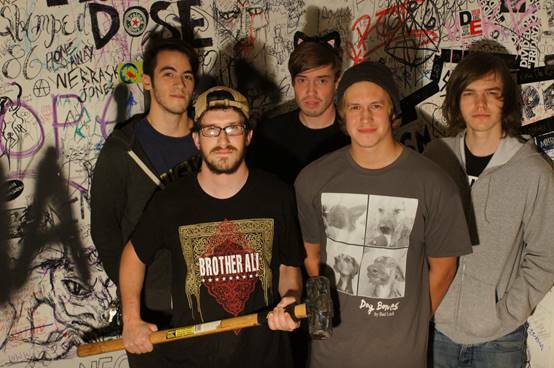 Like Mike is a pop punk band from Marietta, Georgia. This 5-piece formed back in 2011 and are influenced by contemporary artists including The Wonder Years and The Story So Far. In 2014, the band toured extensively in the southeast. They got a chance to play shows with bands including Knuckle Puck, Neck Deep, and 7 Minutes In Heaven. They’re currently working on a 2015 summer release so I sent over some fill in the blanks to learn more. Be sure to check out their 2014 fall single “Knuckles Deep” below. We met each other….Corey and Dan met in elementary school while attending Mount Paran Christian School. I started going there in middle school and then the three of us began playing music together. From there Corey and Dan began going to Sprayberry High School where they met Billy and Edward. Through high school, me, Corey and Dan played in one band while Edward and Billy were in another. Right after we graduated both of our bands broke up and so we decided to form Like Mike. The pickiest eater is….Me (Zak). Don’t put cheese on my burgers or I’ll throw a big rockstar fit. The most OCD member is….This also goes to me (Zak). Because I actually have OCD. For fun we like to….Most of the band enjoys partying. I did for a while. I don’t party anymore though. I enjoy my 8 hours of sleep. We’re currently listening to….I haven’t been listening to much lately. I have a hard time getting into a band if I can’t relate so the bands I really like are few and far between. Billy has been listening to Asian Kung Fu Generation. Corey has been listening to Such Gold. And Dan has been listening to Enter Shikari. One thing we want you to remember while listening to our music is….I don’t think we really have a goal in mind of what we want people to take away from our music. We write it from the most honest perspective we can and hope people can relate. Everyone takes something away from music. Maybe our songs help you. Maybe you just like the sound. Maybe you hate it and think we’re a terrible band. There’s nothing to really remember while listening to our music. We just appreciate anyone who takes a minute to see if they’ll enjoy it. Our craziest or most memorable gig was….Definitely playing the Atlanta date of the 2014 Vans Warped Tour. We didn’t know if getting to be a part of Warped Tour would ever happen but we got to play it and had some people singing along to our music. Another awesome one was getting to open up for Neck Deep. The show sold out and we had some people singing along to our words then as well. If we play another artist’s music it’s….We’ve actually played a couple cover nights at venues. We did A Day To Remember one night and Set Your Goals another night. The new record will differ from our previous releases because….The lyrical content will definitely be different. I’m done writing songs about breakups, past relationships, etc. I currently have the best girlfriend ever so the music wouldn’t be honest if I was writing about all my exes that I’ve completely moved on from. The sound is slightly different as well. The writing of this next EP has been more of a team effort. Everything has been jammed out at practice. Before this, in most cases Edward would cook something up and send us the audio files. I’d put my lyrics over it and then we’d learn the song at practice. Something odd we want our fans to know about us is….Dan has the world’s largest outtie belly button. In the next six months you should expect….Hopefully a new EP. We’ll be hitting the studio soon. There’s not an exact release date yet though. From there we’ll be doing some touring. This entry was posted in Fill In The Blank, Interviews, Uncategorized and tagged "knuckles deep", band interview, fill in the blank interview, fill in the blanks, georgia, georgia pop punk, interview, LIKE MIKE, like mike band, pop punk, pop punk interview, pop punk music. Bookmark the permalink.